If you are wondering if almond flour, rice flour, or chestnut flour work just as well then this is the place to look. Some coconut flour substitute options may require a little tweaking of the recipe, but it can be done. You may need to add another egg or a little more butter and adjust your cooking times. This article will give you needed information on how to use a substitute for coconut flour and how they compare. Nut flour are good low-carb and gluten-free options for baking. You need to use 25 percent of what you would be using in coconut flour. In cakes that require eggs, use 50 percent of what you would use in coconut flour. These flours need to be used sparingly to avoid overpowering any other flavors you have in your baked goods. Use only 25 to 30 percent of what you would use in coconut flour. If you are using Buckwheat flour to make rolls or breads, use a whole cup for a nutty wheat flavor. These flours make baked goods chewy and are good for pizza, pasta, bread and cookies. They can also be used for thickening in sauces and gravy. Use these sparingly to prevent a gummy texture. Use about 25 percent of what you would use in coconut flour. Bean flour gives your baked goods fiber and proteins. They have a strong flavor so use them with other things that have strong flavors like chocolate. Use about 30 percent of what you would use in coconut flour. Teff (This is a seed that comes from Ethiopia and has been used since ancient times. It is very high protein and nutty. It is good for making crackers, eaten as cereal and can be used in small amounts to make breads, cookies, pizza, and muffins. These are high in fiber and can even be soaked in water to make vegan egg replacer. When using as flour, use dry at 25 percent of what you would use in coconut flour. High Protein Flour: Take 1 ½ cups white rice flour, 1 ¾ cups tapioca flour, 2 ¼ cups soy flour and mix together. Recipes made with this substitute for coconut flour will be denser. All Purpose Flour: Take ½ cup rice flour, ¼ cup tapioca flour, and ¼ cup potato flour and mix together. This blend is good for lighter recipes such as breads, pancakes, and muffins. You will also need to adjust your liquids. Coconut flour needs more liquid and eggs than other flours. Any recipes that call for coconut flour and you use a coconut flour replacement, you will need to adjust your liquids down. For example: If you are using ¼ cup flour substitute, you will use 2 beaten eggs and ¼ cup milk or water. In the same sense, when you use a coconut flour substitute, adjust your numbers up or down for the new flour. 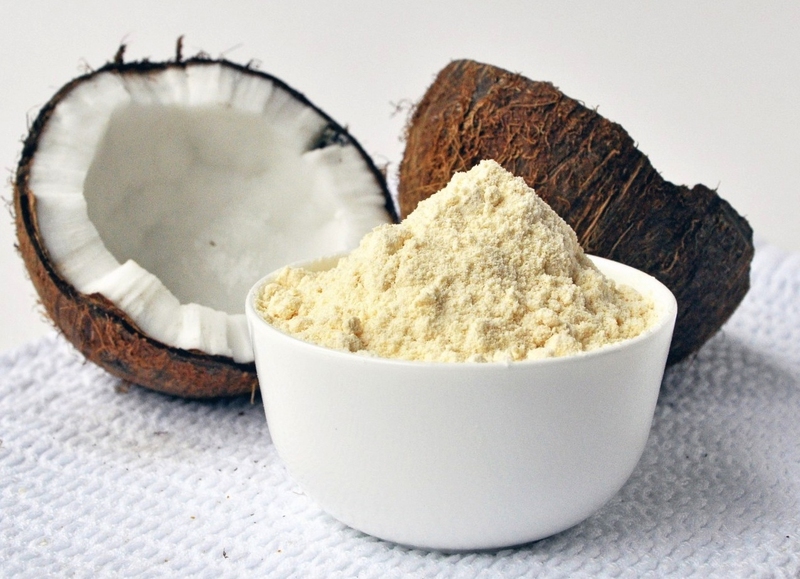 The percentages above for each type of coconut flour substitute will help you gauge how much of the new flour to use in the recipe. It may take a few “trial and error” runs to see what works best. Since coconut flour requires more liquid and less of the coconut flour, you will also need to use less liquid if you are using a substitute for coconut flour. When adjusting liquid and eggs down, make sure you won’t need to use xanthan gum in the recipe. Xanthan gum is an egg replacer that gives batter its gummy texture. Some gluten-free recipes and flours require xanthan gum for binding the flour together since it does not contain gluten.